Georg completed The Grid on September 16, 2011, on his 71st birthday. 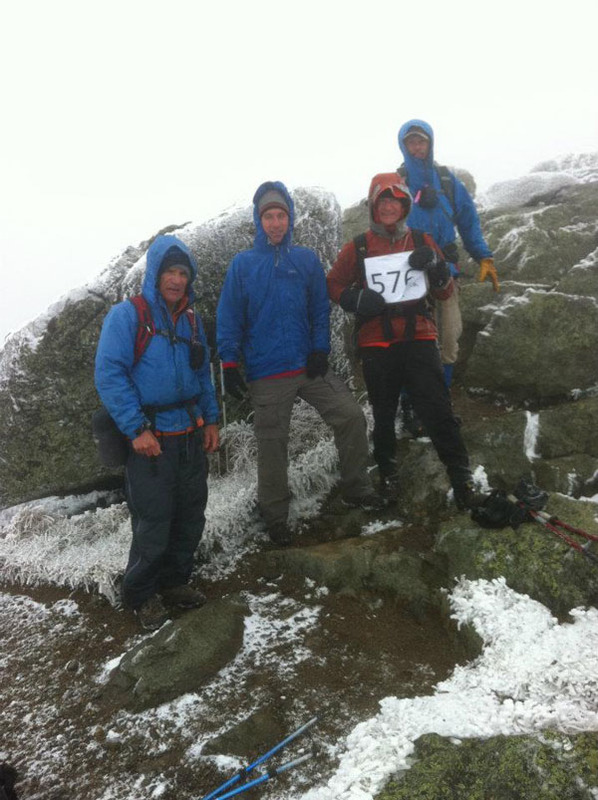 He finished on Mount Monroe by way of Mts. Pierce and Eisenhower in sleet and snow. He was accompanied by Bill Marcotte, John Sobetzer with his dog Pepper, Steve Corcoran, Doug Hunt, Ned Bergman, and Per Frost. Below, Georg finishes The Grid on Mt. Monroe with Bill Marcotte, Steve Corcoran, and John Sobetzer. Photo taken by Doug Hunt. To view Georg's Grid click here. Here is a list of some of Georg's other hiking milestones and accomplishments. Here are a couple more pictures from Georg's adventures. Coming off Mt. Liberty, April 22, 2011. PLAINFIELD -- It was a mild February day two years ago when Mount Washington's Lakes of the Clouds took on a very literal meaning for Georg Feichtinger and his friends. Having just reached the summit of the 6,288-foot behemoth, Feichtinger's group had begun their descent when they rain into a precarious situation. "It was really a beautiful day; we weren't worried about the conditions," said Feichtinger, a native of Austria -- now a Plainfield resident -- and a retired Kimball Union Academy history teacher. "There was a thick undercast of clouds beneath us, but we thought we would be well into the woods by the time we hit it. All of a sudden, the clouds rose and we were in a big snow-and-ice field in the thickest fog I've ever been in. "There was no trace of the trail, no cairns to help us find the trail, nothing like that. We walked in circles for a while until we finally found a sign covered in snow. We wiped it off and all it said was, 'No Camping,' but even that was quite a relief. That meant we were near the Lakes of Clouds (hut) and after we found that, it was easy to find the trail." That's just one of hundred of adventures Feichtinger has come across in the thick, high New Hampshire woods. 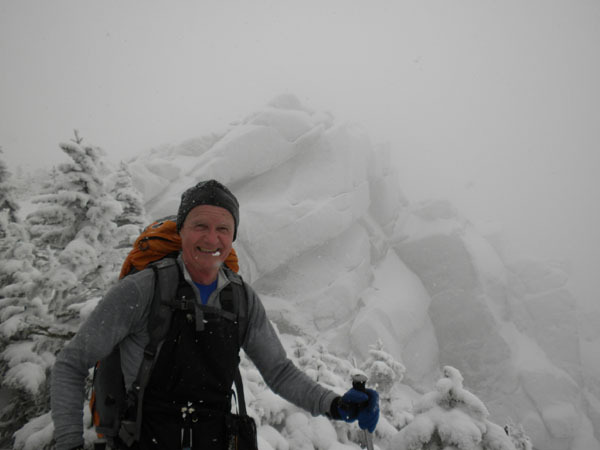 On his 71st birthday, Sept. 16, the former KUA skiing and soccer coach became the 21st hiker -- and the oldest -- to complete the Granite State's fabled "White Mountains Grid." 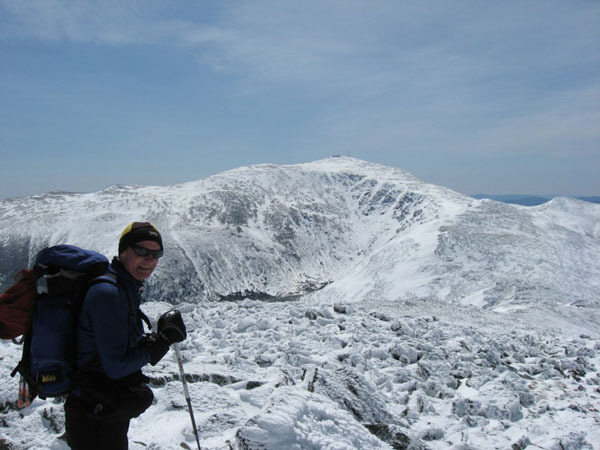 In a concept made popular by Chester, N.H., mountaineer Ed Hawkins, completing the Grid means climbing all of New Hampshire's 48 mountains that stand more than 4,000 feet during every month of the year. That's a challenge that equals a total of 576 summit climbs. "I've always loved being outside, so this was an excuse to get out there as much as possible," said Feichtinger, whose first name is pronounced GAY-org and who maintains an Austrian accent. "I first completed the 48 (4,000-footers in New Hampshire) in 1994, and I'd never heard of the Grid." Growing up in the town of Saalfeden, Austria, on the foothills of the Alps, Feichtinger has always associated himself with the mountains. As a youth, his idea of a sleepover with buddies meant foraging into the towering peaks near his home -- many of them well over 8,000 feet -- and camping out in huts. "I don't know many people who would let their kids do that today, but those were the kinds of things we did for fun," Feichtinger said. Always one to keep track of the dates of his significant climbs as an adult in New Hampshire -- the Appalachian Mountain club's guidebooks offer charts for hikers to do so -- Feichtinger heard of the Grid four years ago and realized he already had completed about 64 percent of it (370 of 576). "After that, it became an obsession, as you might imagine," he said. "Most of the people who do these lists, it is to (satisfy) a compulsive need." With many of his holes on the Grid existing in the first third of the year, Feichtinger enrolled in a winter-climbing workshop with AMC and learned important preparation tactics: Identifying trails in snowy conditions, not hiking alone and always bringing a compass and map. "Especially on (the portion of the White Mountains) that are part of the Appalachian Trail, it can be really hard to find the blazes in the snow, because they're white," Feichtinger said. "They're not visibile sometimes, and the trail can be narrow enough that you can't tell it's there (in deep snow cover). So, you have to look for things like (evidence of) maintenance; cut branches and things that aren't natural, in order to find the trail." Feichtinger found the most challenging month to be April, when there is still plenty of snow and ice at the higher elevations, but enough thaw in lower sections that the safety of river crossings can be difficult to determine. There were times that a crossing would appear to be unsafe, but turned out to be thawed only at the top while underneath it was frozen for several feet. "Owl's Head in Franconia, that's an 18-mile round trip and a lot of it is flat," Feichtinger noted. "There are a lot of river crossings. There were times when I would take off all of my gear (to lessen the weight) and walk across to test how steady the ice was, and then go back and get my stuff. You're dealing with a lot of mysteries." "I have skied all my life, but (winter hiking) is less expensive and it's very good for building endurance," said Feichtinger, a fit 5-foot-5 and 125 pounds. "I hope I can be doing things like this for a long time." 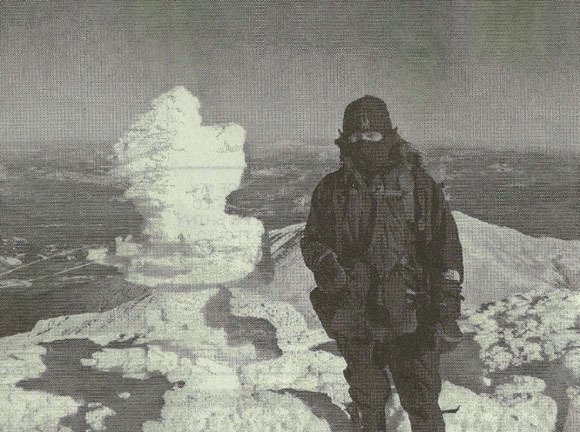 Georg Feichtinger stands atop Mount Adams in 2009.